Pushups are a highly effective body-weight exercise that can be done three to five times per week. They develop strength, endurance, lean muscle mass and clear muscle definition in the upper body and abdominal area. Pushups are a resistance exercise, meaning they burn a large amount of energy, thus contributing to fat loss. They are also very adaptable -- they can be scaled to suit any level of fitness, from beginner to elite, allowing them to be an effective movement for anyone to perform. Your chest is very heavily targeted during pushups. The pectoralis major, the two large muscles that sit across your sternum, are fully engaged and must produce a lot of force to complete the movement. As a result, these two muscles become very strong and can become quite defined after doing pushups regularly. Your latissimus dorsi, or "lats," are also used throughout the movement, and over time you will develop lean mass to round out the musculature around your sternum. Your arms do the lion's share of the work during a pushup. Your biceps and triceps are fully engaged throughout the movement and carry the entire load of your body weight. Because the biceps and triceps are bearing a heavy load, while simultaneously exerting a lot of force to lower and raise you, the muscle fibers in your arms will begin to grow. You can expect to see an increase in lean muscle mass in your biceps and triceps if you include pushups as a regular staple of your workout routine. You will also notice significant increases in strength and endurance in your arms. Your shoulders provide a key point of stability that allows you to complete the pushup. While your elbows are hinging, your shoulders keep your upper back aligned, stable and engaged. 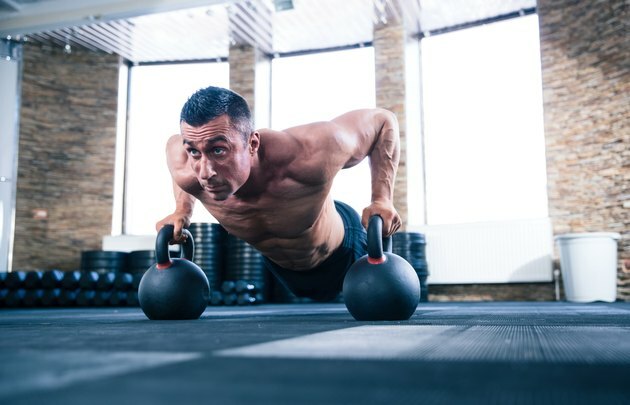 Your deltoids, the round muscle on the crest of your shoulder, is put to work here, becoming stronger and denser the more frequently you practice pushups. You should see an increase in both muscle definition and joint stability from doing regular pushups. Your abdominal muscles get a solid workout during pushups. Your rectus abdominus -- the "six-pack" muscle -- keeps your spine supported and prevents your hips from dropping toward the floor. Meanwhile, your obliques keep you stable and stop your body from shifting throughout the movement. The serratus and trapezius muscles are also targeted, contributing stability and force to the movement. Your abdominals and upper back become stronger, more stable and more defined as a result of doing pushups. This also improves your posture, balance and your body's overall work capacity.